I am enjoying a color theory 101 class. We have an assignment to create something using all of the different color schemes. I share my quilts with the class and our instructor encourages me to use what I learn in fabric. Does anyone have any ideas on which quilt block or pattern I might use to demonstrate color schemes. 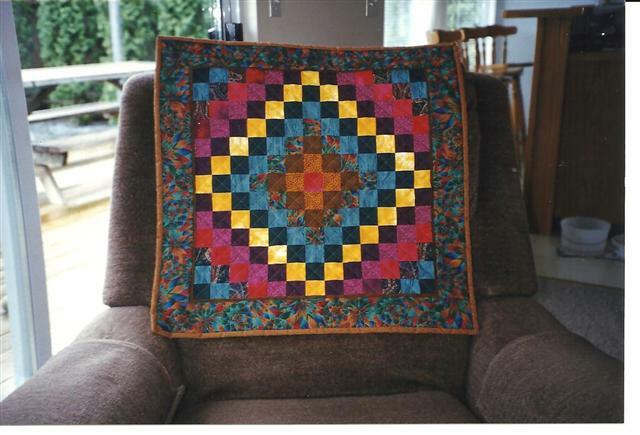 It doesn't need to be a large project, just a wall hanging or table topper would be fine. Just looking for some different ideas. How cool!!! Log cabin??? Would love to see your completed project! Many years back I took a course, I'll try to attach a photo of the wallhanging our teacher had us make. Just found a 2nd sample from that same class, maybe it might also give you an idea? If you tell us what color schemes you studied then maybe we can offer suggestions more directed to the assignment. French braid is definitely a possibility as is log cabin, Pineapple, chinese coin or even a quilted depiction of the color wheel using a wedge ruler. A dresden plate or grandmother's fan would give you options for lots of colors. 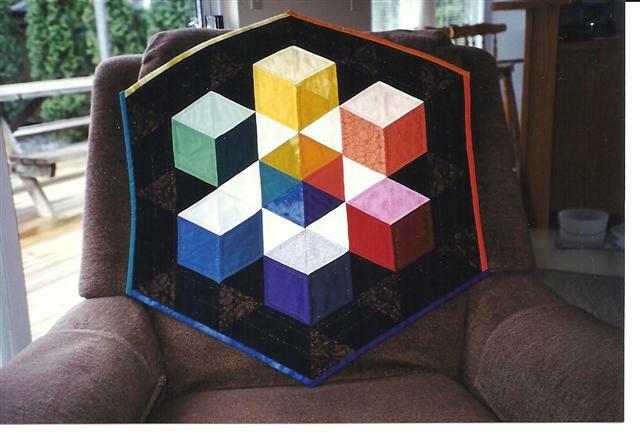 I want to make some blocks= a small quilt demonstrating harmonies and schemes of color theory. I am looking for ideas of blocks I could use to demonstrate. Not sure if this is what you are looking for but I thought of it when I read your post. google it or look on pinterest - lots of ideas out there. I googled images for color theory quilts. Also , look on ebay for ideas or you tube. Hello! Havent thought or discussed achromatic schemes? Or the color wheel? Thimblebug I know you said you don't know the pattern but I love the block quilt. I searched briefly for the pattern and couldn't find it I could probably figure it out from the picture. I will have to mess with it later. This looks like some of the patterns Karen Combs teaches. You can Google her name. Love these! Especially the second one. Your choice and placement of colors makes this spectacular! Really love the bright gold that sets everything else off. Just beautiful. So many wonderful suggestions! I am pondering..... I'll post what I come up with. I'm not sure what is meant by "color scheme" in this context. It seems to me that the way that term is used by laymen would make that an impossible assignment because of the infinite variety, but I'm sure I have that wrong! Anyway, what comes to mind is a values quilt, usually made with half square triangles, in mixtures of light, dark and medium. The emphasis is on bringing out a design by arranging the lighter and darker halves in various ways. If you google "values quilt" you'll get many examples. The Dresden plate was my first thought, too. It's perfect for a traditional color wheel. A Chinese coins quilt might work, too. That's a very easy quilt to make. Have you checked Christine Barnes' website? I had her for a color class several years ago and we made different blocks. She also sells patterns that demonstrate the different theories. I visited a website--that I can't find right now where her challenge was to make a block a month, that would each be a different color--She used a block format with a circle in the center. This large circle would be different --lets say aqua fabrics that were all mosaic(ed) with zig zag on a white square. So you could do each block in the same format the white background/grout. With the color in the circle being the part you were working on for your block of the week. Hope I made sense! Another idea is actually not a block, it is a notebook. On one of the news letters I got recently the woman took classes on fine dress embellishment. They were all required to make a journal of their progress. She used a regular notebook with page protectors that could hold items, and class notes. It would tell how she did something (contained in the journal). Just think of how much better retention we would have of projects, and how to's if we didn't have to relearn something when we did it again!